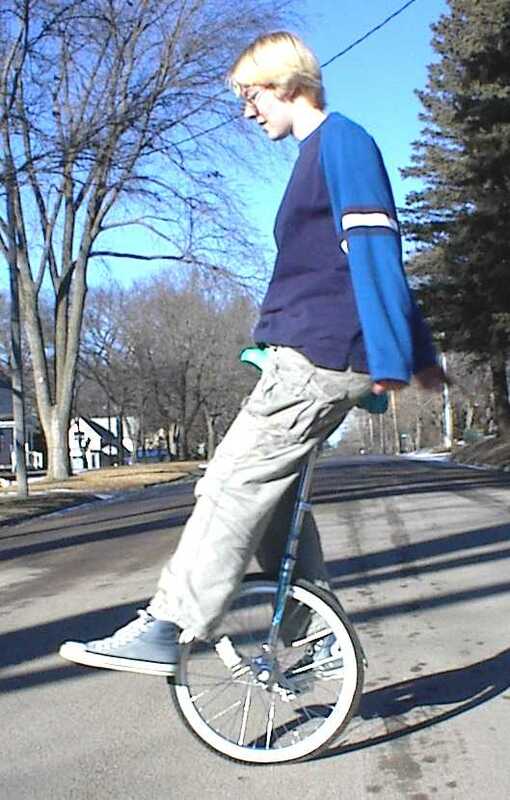 As long as you only have one wheel, you might as well ride with one foot, right? Basically, as you're riding along, you just take your foot off the pedal and put it on the frame. Of course that won't work the first time (or second or third...) you try it! We recommend keeping your dominant foot on the pedal, at least for starters. Press into the pedal with more pressure with your dominant foot while lightly resing your non-dominant foot on the other pedal. Then get up to a somewhat fast pace and remove your non-dominant foot. Most likely, your uni will buck you right off, but it will get easier. Some things to keep in mind: Don't go too slow. Lean forward and keep your speed up. It helps if you're riding *slightly* downhill rather than uphill. Place your foot firmly on the frame, pretty high up. Keep pedaling and pretend like it's no different than 2-foot riding. Use your arms for balance. Just go for one revolution at a time. First try to get one full pedal crank. Then try for one and a half, two, three, and eventually you'll get it. Like anything else, persistence is the key. 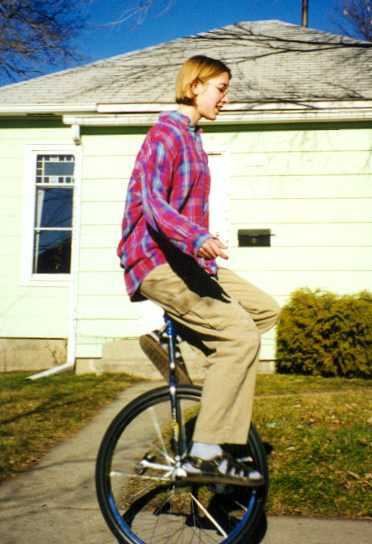 Keep trying, and eventually you will be able to get two or three pedal cranks with just one foot. It feels really weird! Then one day - BAM - you'll get like 20 pedal cranks. Then to learn it with the other foot, start alllll over! Once you master riding with your foot on the frame, the next step is to make the transition BACK to the pedal. Ride along with one foot, then slow way down and let your foot fall onto the pedal, and continue forward. At first, it was easier to get back on the pedal if we actually rocked backwards one-footed, returned the foot to the pedal, idled, and continued. The ability to transition from two feet to one foot to two feet again is very nice - it makes your one-footed skills much more impressive, and it's SO much nicer to not fall off at the end of a great one-footed surge. The easiest way to do it is by placing one foot on the frame. However, another way is to extend your leg out in front and point the toe, which is harder but it looks about ten times cooler. 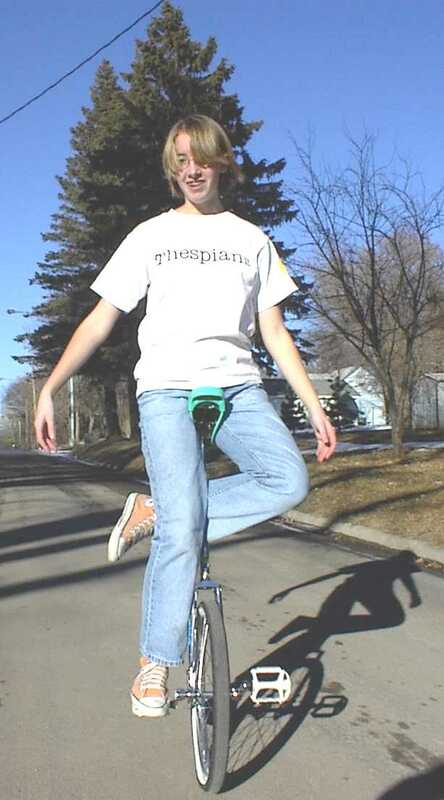 It takes a little persistence because you don't have as much control on the unicycle itself, but if you can ride one-footed using the frame, it shouldn't take that much longer before you start getting the hang of extending. Once you get good, try turning corners and riding in figure eights one-footed. Some people recommend learning one-foot idling before one-foot riding. 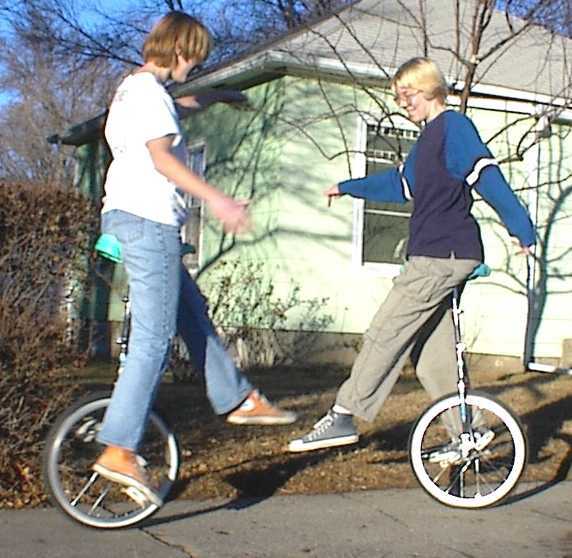 It's up to you, but we figured since when we first learned to ride a unicycle, we learned to ride forward before idling, we would conquer one-footed idling after we could ride forward one-footed. You can start by doing regular idling, then remove one foot and place it on the frame. The trick is to bend the knee of your idling leg a LOT. You can use a wall to help learn, also. Learn this with both feet. 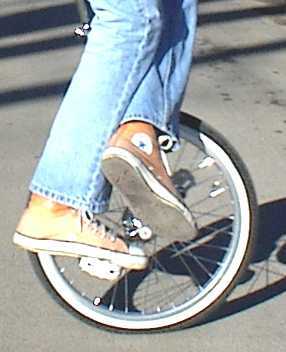 Then, try to transition from one-foot idling to one-foot riding. Cool? Oh yeah. Once you get good, you'll find that one-foot idling is actually easier than two-foot. You can have a lot of fun with one-foot idling because there are tons of variations, including extending your leg, bending it back, etc. Here are pictures of a few.